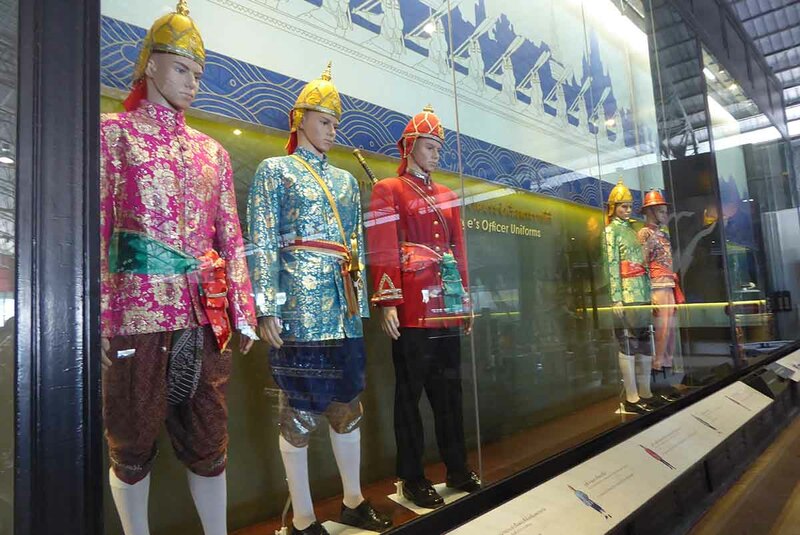 The National Museum of the Royal Barges is on the Thonburi side of the Chao Phraya River near the Pinklao bridge. 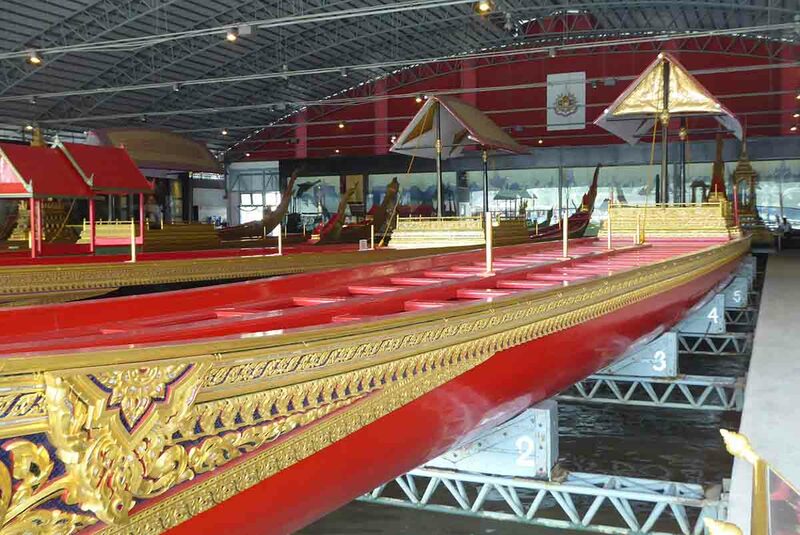 The Royal Barges are displayed in a large Khlong side boat shed. The museum opened in 1971 after restoration work on the barges. 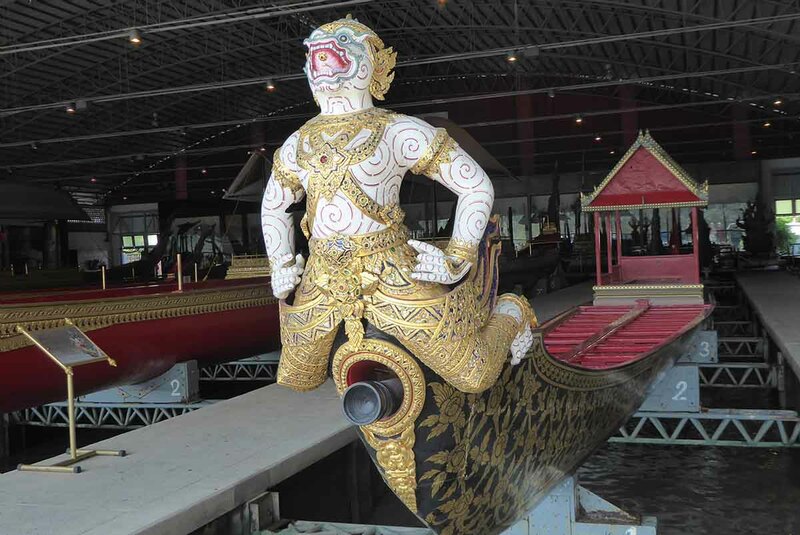 On display in the Royal Barge Museum are 8 barges. Each barge was carved from huge pieces of teak. The barges have a plaque describing the name, its technical details, the crew, and its history. The boats, crewed by up to 61 oarsmen and have up to 17 other crew members. 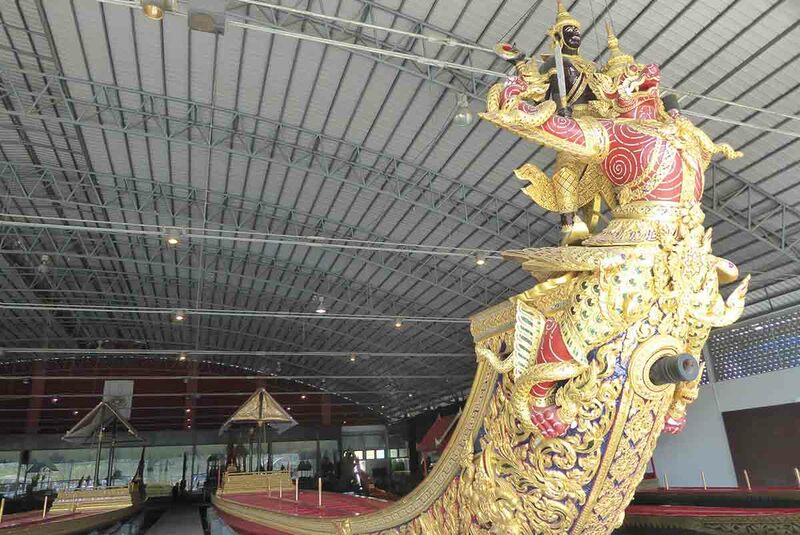 The boats are only used now on special occasions such as important ceremonies of state. 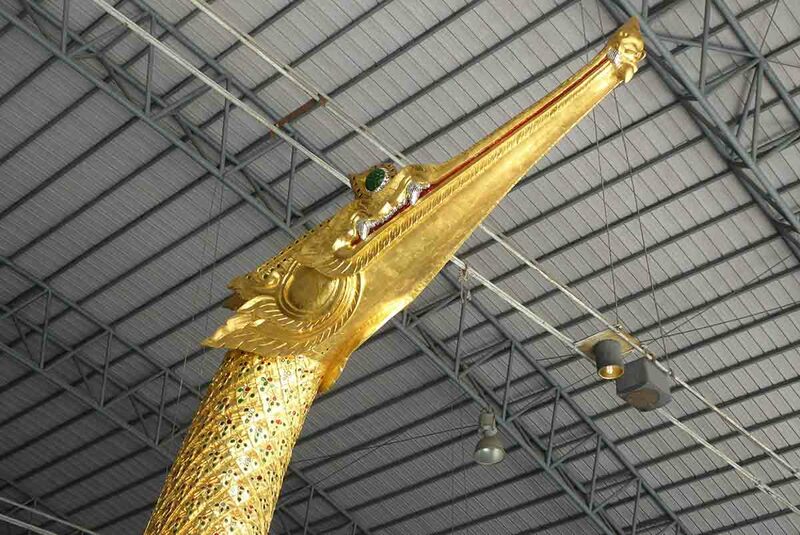 Some of the barges have mythical creatures gilded in gold carved on their prows with a cannon below the creature. Each of the barges has a name. The Suphannahongse is the King’s personal barge and is the most important. It is the largest dugout boat in the world and the name means Golden Swan. A large swan head is carved into the prow. 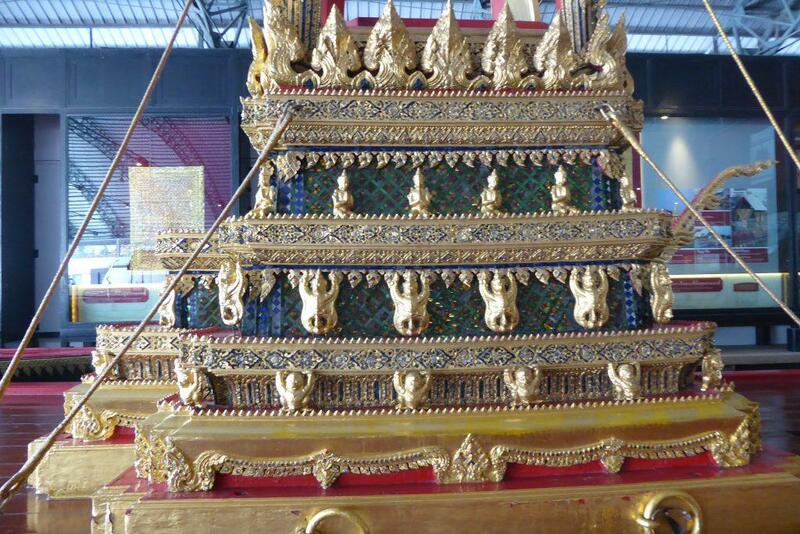 The Suphannahongse Royal Barge, completed in 1911 during the reign of King Rama VI. It is 46.15 meters in length and requires 50 oarsmen and 14 crew. 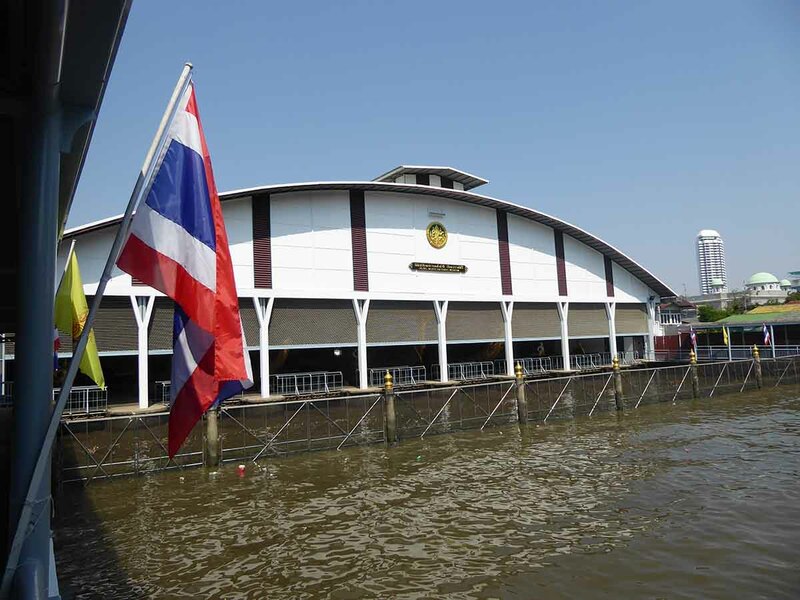 The Krabj Prab Muang Mara Barge is 28.85 meters in length. It requires 36 oarsmen & 17 crew. It’s completion year, 1967. 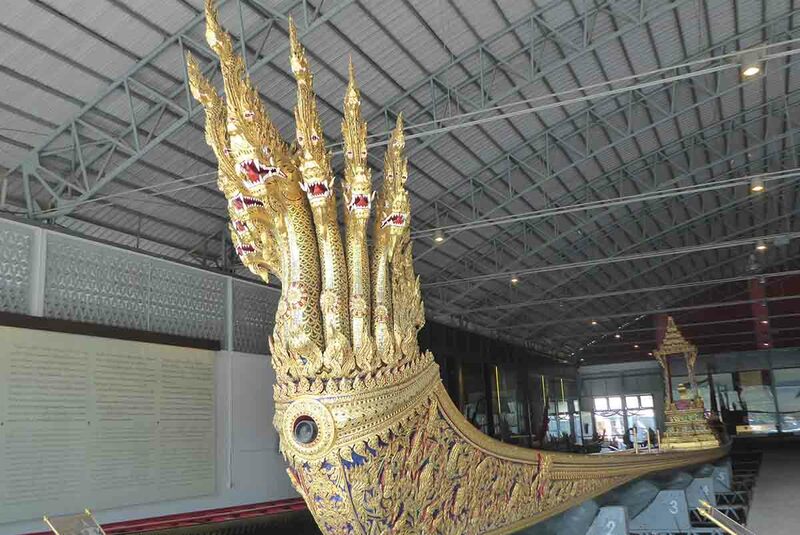 The Narai Song Suban H.M. King Rama IX is 43.30 meters in length requiring 50 oarsmen & 14 crew. It’s construction, completed in 1996 for the golden jubilee of King Rama IX. 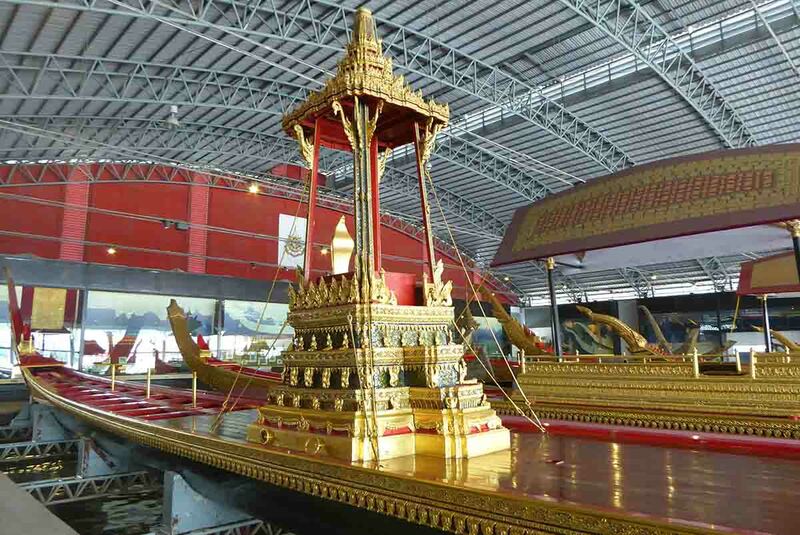 The Anantanakaraj Royal Barge, built in 1914 during the reign of King Rama VI. The barge has a length of 44.85 meters. It has 54 oarsmen & 18 other crew. 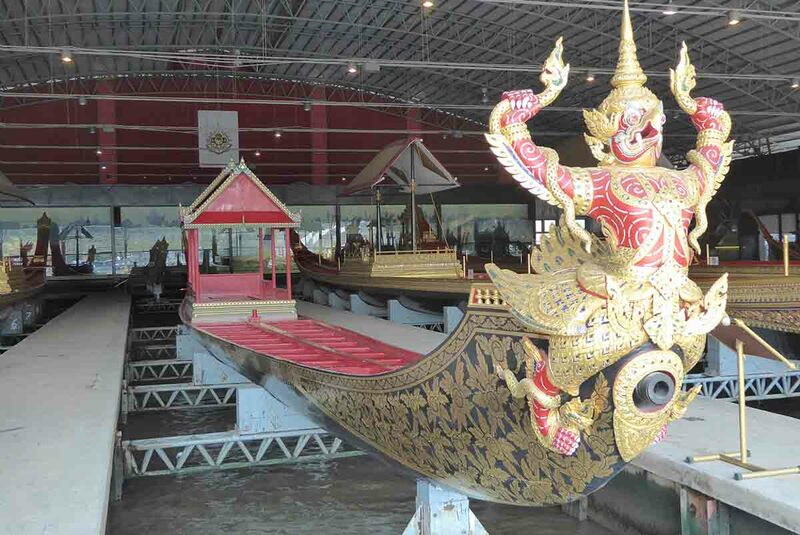 The Aaora Vayuphak Barge is 31 meters in length and requires 38 oarsmen and a crew of 17. The original date of construction is unknown but restoration was completed in 1981-82. 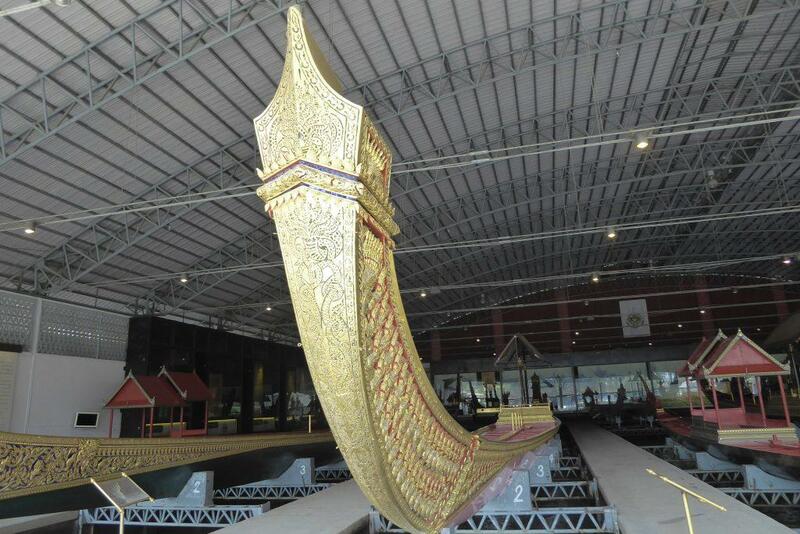 The Annekatchatphuchong Royal Barge is 45.67 meters long and needs 61 oarsmen & 14 crew. 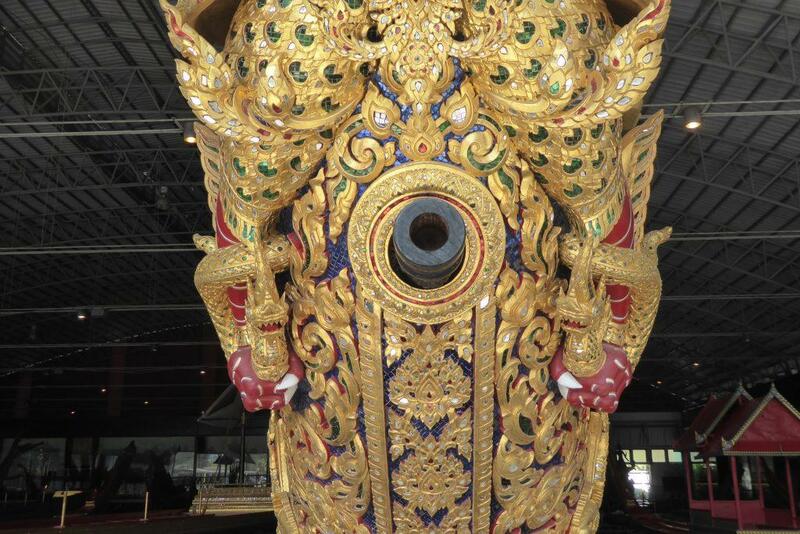 Construction took place during the reign of King Rama V.
There is also an exhibition on the history of the barges featuring items such as ceremonial uniforms, ancient prow figurehead sculptures, thrones, oars, a model of the Royal Barge Procession and the remains of some ancient barges. The museum has no cafe though there are some nearby refreshment outlets in the local community just outside the gate. Admission is 100 baht. If you want to take photographs you have to buy a photo ticket at 100 baht or for video 200 baht. There are several ways to get to the museum. 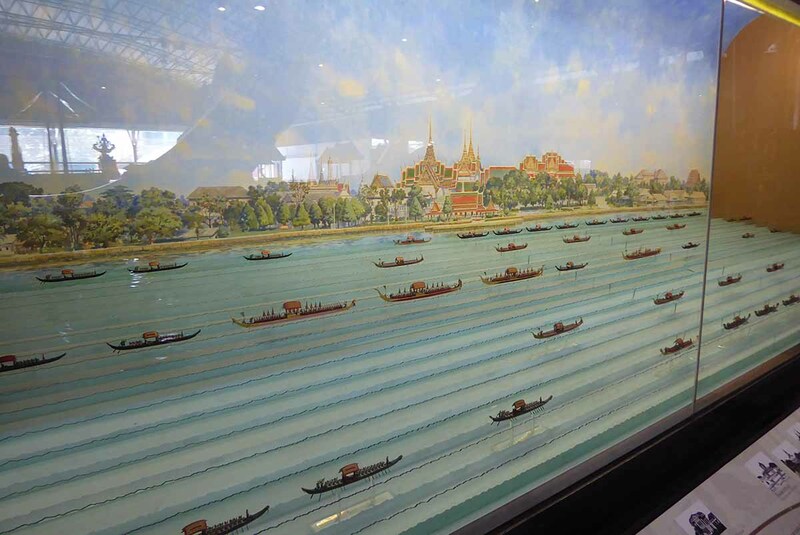 The best way is to take the Chao Phraya Express Boat to Phra Pin Klao Pier (N12), then it’s a short walk to the museum. 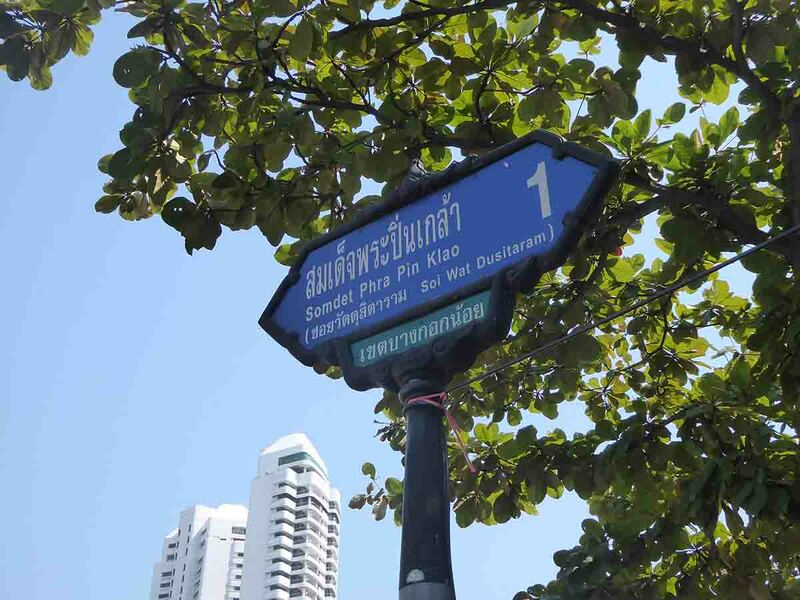 Turn left into Somdet Phra Pin Klao Soi 1 (Soi Wat Dusitram), the route is signposted from there. Follow the path through a local community. It’s quite safe. After 10 minutes, you will arrive at the museum. You could also take a motorbike taxi at the mouth of the soi. 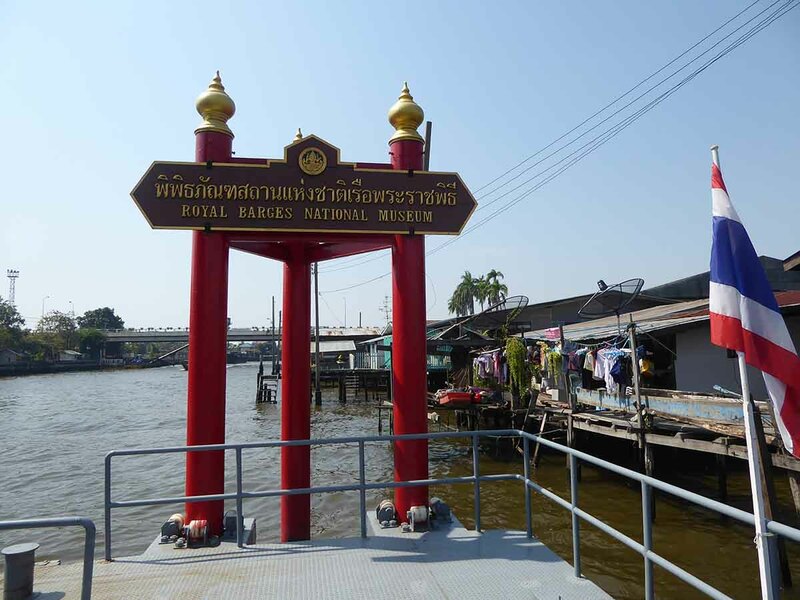 You can also walk over the Pin Klao bridge with access from Phra Athit road next to the tourist office, take the cross-river ferry from there or take a bus over the bridge disembarking at the first stop. Location: 80/1 Arun Amarin Road. Rules: No photography unless you buy a photo pass at the ticket office. 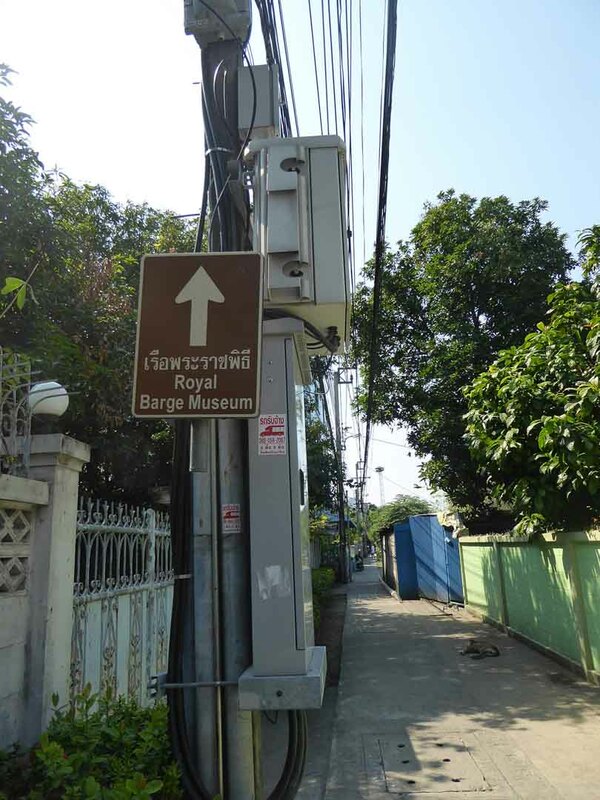 Walk: Access through Somdet Phra Pin Klao Soi 1 (Soi Wat Dusitram), the museum is signposted from here. Boat: Chao Phraya Express Boat to Phra Pin Klao Pier (N12). Then Walk as above or take a motorbike taxi. 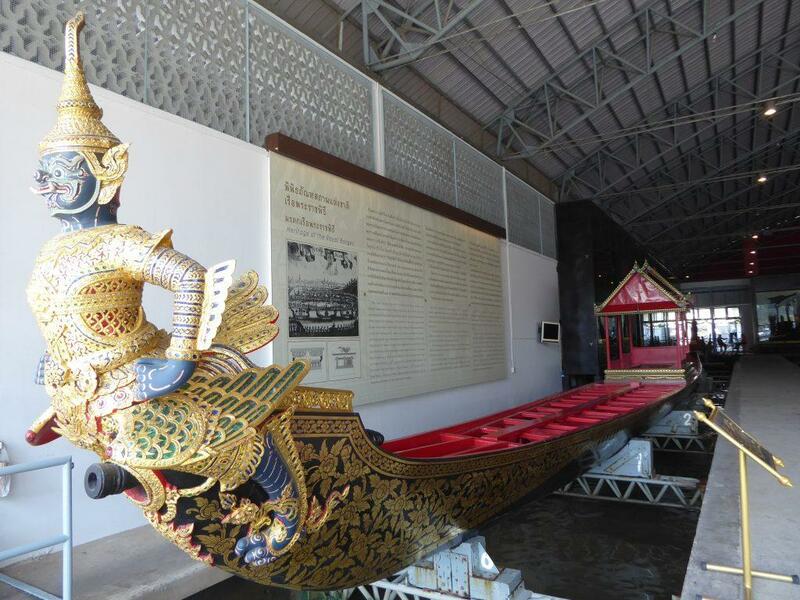 River Taxi: You can hire a river taxi to the Royal Barge Museum Pier. Bus: 57, 79, 80, 81, 91, 123, 124, 127, 147, 149, 507, 509, 511, then walk or take motorbike.